I am almost at the end of my Zone Challenge (which I participating in at my gym). While it hasn’t been perfect for me, I have learnt so much about nutrition and it has forced me to try so many new combinations of food. I can be a creature of habit when it comes to food, so trying something like Cauliflower Rice is actually quite adventurous for me! I was not at all certain that I would like it and was pretty sceptical about how tasty it might be. Others from the gym raved about it, so I thought I would give my own combo a go and yes it is as good as they said! To me it has more of texture of cous cous more than rice, to the point that when Mr I came in from work and I asked him to taste it not knowing what it was, he said it was cous cous, with a different flavour! 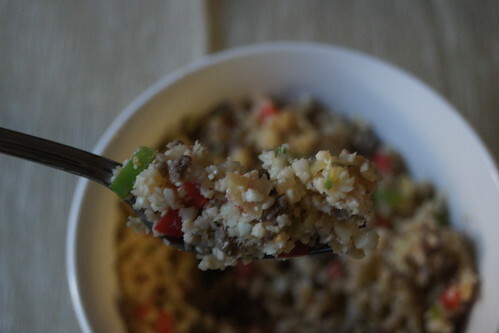 I mixed beef through my cauliflower rice as I had left over taco meat. I have updated my taco seasoning recipe to be “cleaner”, you can find it here – homemade taco seasoning. You can eat it as is for a vegetarian option, or add any cooked meat you like. If you are doing the Zone, the ingredients below with 114 grams of beef makes a four block meal. The trick for me enjoying eating cauliflower, which I have not previously done, is not to steam or boil it, but cook it up in the frying pan. Add some lovely spices and veggies and let it cook gently. It also tastes great cold, making it a fab portable lunch option too! Cut up cauliflower into small pieces. Finely chop onion, capsicum, snow peas and prepare garlic for crushing. 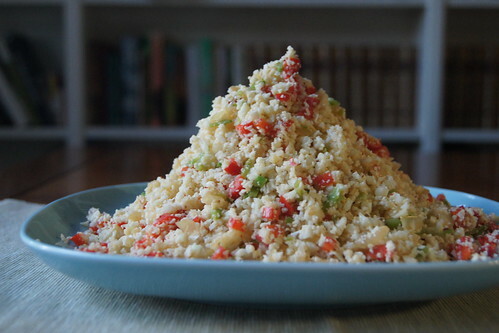 Pulse cauliflower in a blender until it is a fine consistency similar to cous cous. Heat oil in a large frying pan on a low to med heat. Add onion and fry gently for a couple of minutes. Crush garlic into pan and add chilli flakes. Fry for a couple of minutes. 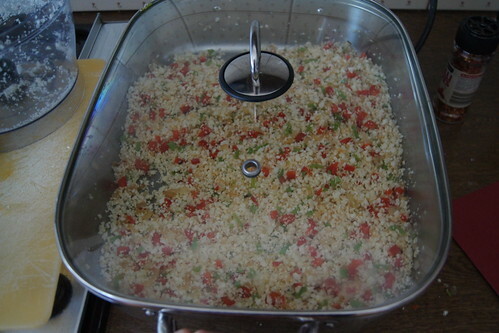 Add capsicum and snow peas and mix well. Place lid on the frying pan and cook on very low temp for about 10 minutes. Test for the right texture for you. The longer it cooks the softer the cauliflower becomes. Serve as a side or add beef etc to it to make it a complete meal. This recipe serves one person for a complete meal, but would serve about four adults as a side vegetable dish. A very simple menu plan for the family this week and it is back to school, so school lunch items to make. The most popular recipes from the blog have been included and more will be added on a weekly basis. The app will notify you when new recipes have been added, so you will be able to deliver plenty of variety in your family’s menu plans. Each recipe lists the ingredients required, easy to follow instructions and a photo from the blog. 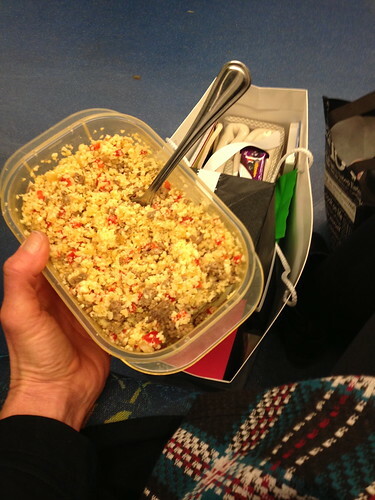 Have you tried cauliflower rice – love it or loathe it?